Days of Our Lives spoilers reveal Abigail Deveraux (Marci Miller) is abducted soon. Chad DiMera (Billy Flynn) takes drastic action after Abby does the unthinkable. Her life is spiraling out of control and she turns to the last person Chad wants her with. The coming days promise heartbreak and then joy for Chad and Abby. Days of Our Lives spoilers show that Abigail will take drastic measures to ensure that she doesn’t end up in a mental institution. After hearing Chad say he’s having her committed Abigail makes a run for it. 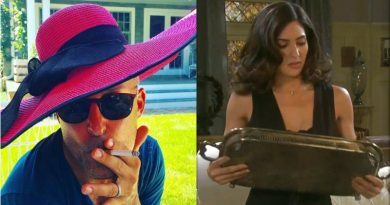 She goes to the man she claims to despise, Stefan DiMera (Tyler Christopher). Chad is Abigail’s husband. So, he has the authority to have her committed. Stefan and Abigail decide the best way to take Chad’s power away is for her to get a quickie divorce from him. DOOL spoilers say Stefan will whisk her away for the divorce. She will then marry Stefan DiMera. Abigail can’t believe that Chad and the rest of her family don’t believe her. She’s being framed. Instead, they are siding with Gabi Hernandez (Camila Banus). Gabi has done an excellent job convincing everyone that Abby’s alters are back. For this reason, it’s no wonder Abigail’s family believes the lies spun by Gabi. This leaves her reeling and Stefan is her ticket to freedom. The marriage will surely shock Abby’s loved ones. Jennifer Horton (Melissa Reeves) already warned Stefan to stay away from her daughter. Learning Stefan is her new son-in-law will indeed anger Jennifer. However, Chad DiMera will be the most shocked. He will learn that his wife is now his ex-wife and also his new sister-in-law. This realization will later drive Chad to do something wild to save the love of his life. Chad will do whatever it takes to prevent a relapse in Abigail’s mental health. Shockingly, he turns to an unlikely source, Ben Weston (Robert Scott Wilson). This week’s soap magazines report that Chad will abduct his former wife with the help of Ben. He loves her and would do anything to protect her from Stefan. Even if it means forcibly taking her. His motivation will be to protect Abigail’s physical and mental health. Chad believes that alter Gabby is already surfacing so Abby spending time with Stefan could be detrimental to her health. Likewise, he’s convinced that Stefan will use his time with Abby to force Gabby to resurface. So, Chad must take action. Chad’s choices will have consequences. He realizes holding Abigail DiMera against her will is wrong. During her last pregnancy, Abigail was taken forcibly by Ben Weston. She doesn’t trust Chad now. His kidnapping her is stressful and she doesn’t need that with a baby on the way. 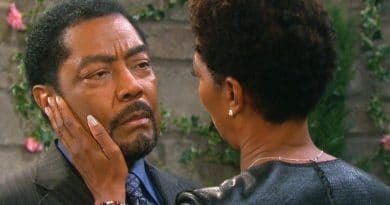 Days of Our Lives spoilers report that Chad DiMera finally decides to free Abigail. But then she goes into labor. Abby gave birth under less than ideal circumstances before. The birth of her second child will follow suit. Chad’s forced to deliver the baby. Will Chad’s actions put Abigail and their baby in harm’s way? Or will Chad be able to successfully deliver a new heir to the DiMera dynasty? It likely that the birth of the new baby will bring Chad and Abigail Deveraux closer. Chad might believe that Stefan is the father but after delivering the baby, there’s no doubt he will bond with the child. This will also be an emotional time for Abigail and Chad. This birth scene might be the moment they find their way back to one another. Unfortunately, she’s now married to another man. A major factor now stands between Chabby – it’s Stefan DiMera. As Abigail’s new husband, he could also turn the tables and have Abby committed so he can take possession of their baby. Will Chad be able to save Abigail from Stefan or did she truly make a deal with the devil? Watch DOOL weekdays on NBC and come back to Soap Dirt for the latest Days of Our Lives spoilers and news. I'm a wife and mother of 3 boys who keep me busy. When I'm not working or taking care of my family, I enjoy watching television, writing, camping, and volunteering in my community. ‘Days of Our Lives’ Spoilers: Valerie Grant Leaving Salem – New Love Interest For Abe? ‘Days of Our Lives’: Has Ron Carlivati Gone Too Far – Gabi Storyline Too Cruel?